Designer and successful businesswoman Anne Orr developed a worldwide reputation for sophisticated needlework patterns and accurate instructions. She sold patterns by mail order and served as the needlework editor for Good Housekeeping magazine for twenty years. The epitome of the southern gentlewoman, Anne Champe was born on April 17, 1875, to Emma Claiborne and Benjamin Franklin Champe of Nashville, Tennessee, where she grew up and attended local schools. She studied art at a private finishing school for young ladies, and at the age of nineteen married John Hunter Orr, a handsome young man whose family owned a wholesale grocery supply business. Their wedding in her parents' mansion in 1894 was said to be one of the most brilliant gatherings ever assembled in the city of Nashville. 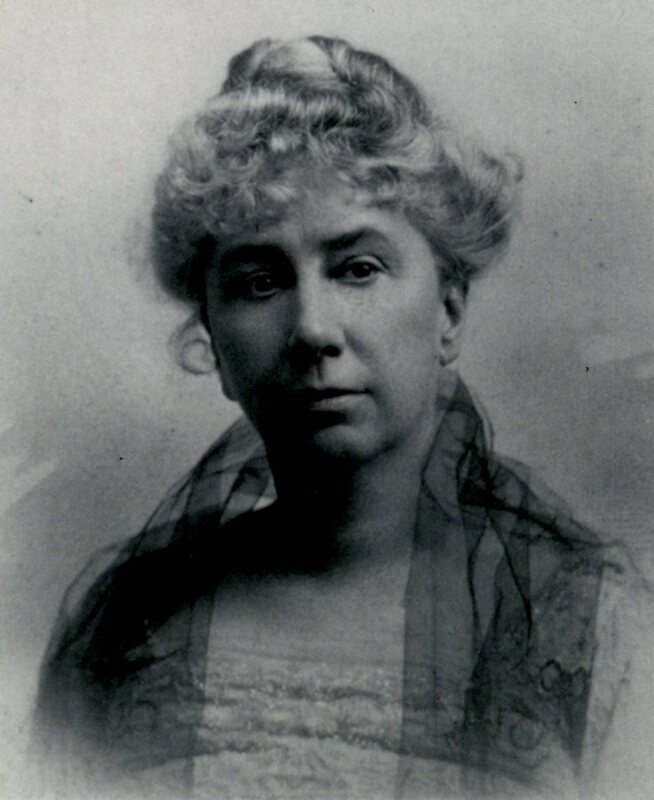 After her marriage, one of Anne Orr's first projects was raising funds for the construction of the Woman's Pavilion for the Tennessee Centennial Exposition held in Nashville in 1897. This group of fund-raising women formed the Centennial Club, which has spearheaded campaigns for civic pride, cultural enrichment, and social services for more than one hundred years. The Southern Woman's Magazine, published by several prominent Nashville women, appeared in 1913. Anne Orr became its art editor, providing monthly columns on antique collecting and needlework. With this exposure, she set up a mail-order pattern service, and in 1915, she received her first copyright for a booklet, called Centerpieces and Lunch Sets in Crochet Work. In 1917, Coats Thread Company began publishing her pattern booklets, starting with Crochet Book for Gown Yokes and Boudoir Caps. In 1917, the Nashville Banner described Anne Orr as "a pioneer in the application of art to everyday life. No longer does art consist of pictures and statuary for the privileged few. Many of the simplest and least expensive articles of household usage have been made artistic and attractive." Anne's hometown needlework business, it was reported, had just received an advance order for 500,000 copies of one of her booklets. Anne Orr had made a name for herself on the world stage in a remarkably short period of time. In 1921, Anne Orr became needlework editor of Good Housekeeping magazine, a position she held for the next twenty years. She contributed a monthly column about needlework, and readers ordered patterns from the magazine's New York offices. In the 1920s, her needlework articles featured crochet, cross stitch, embroidery, knitting, needlepoint, and tatting, reflecting her personal interests as well as the popular needle arts of the time. Only rarely did a quilt pattern appear. Anne Orr was concerned about the accuracy of her directions and employed a number of Nashville women to produce handcrafted items using her patterns. One news article reported that she employed one hundred women. The Orrs had three daughters, who made their debuts at Nashville society balls. Later, two of them, Anne and Mary, managed the Anne Orr Studio. In 1928, at the age of fifty-three, Anne Orr became a widow with a lavish house and lifestyle to maintain. Her thriving needlework business may have provided the financial stability the family needed as the economic depression widened. At the end of the 1920s, Anne Orr took note of the revival of quiltmaking and added some traditional quilt patterns to her needlework offerings. By 1932, when she published a pattern booklet titled Quilts and Quilting - Set No. 100, she had introduced modern designs to tempt contemporary women who may not have considered quilting as a hobby. Her line of pieced patterns reminiscent of cross-stitch became her trademark in quilt design. Because of her national reputation as a needlework designer and writer for Good Housekeeping, Anne Orr was chosen to judge the first national quilt contest held at the Eastern States Exposition at Storrowton Village in Springfield, Massachusetts, in 1932. The following year, she was a final round judge for the Sears national Quilt Contest at the 1933 Chicago World's Fair. In 1939, Good Housekeeping and Macy's Department Store sponsored a quilt contest in association with the New York World's Fair, and again Anne Orr was a judge. 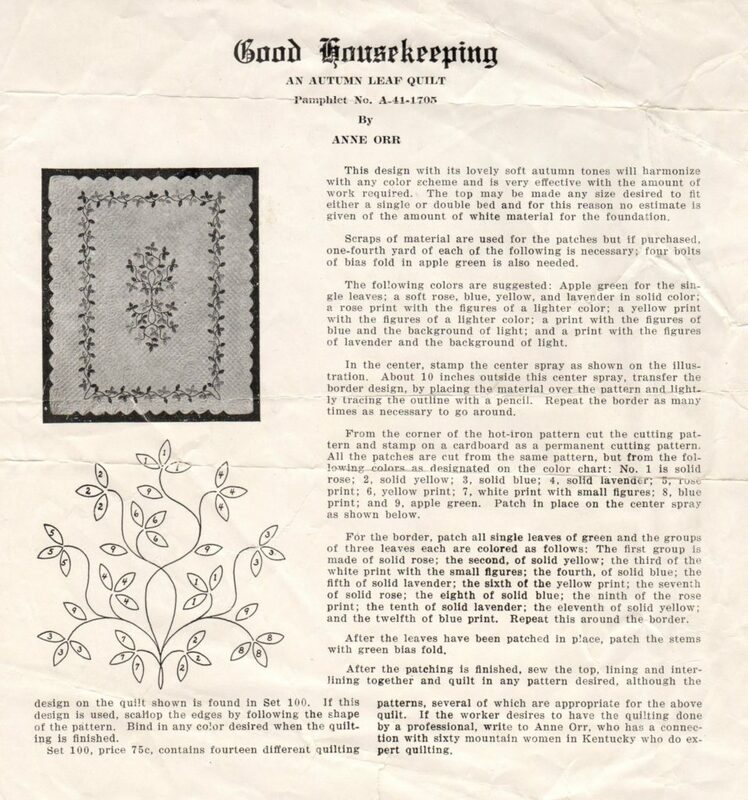 In January 1940, Anne Orr's final needlework article appeared in Good Housekeeping. She later wrote briefly for Better Homes and Gardens in 1943 and entertained the idea of designing patterns for the Stearns & Foster Co. Mountain Mist patterns. She did design quilt patterns for their competitor, Lockport Batting Company, which brought out an edition of her last pattern book, Anne Orr Quilts - Book 50, originally published by Anne Orr Studios in 1944. Anne Orr's work has endured because she has never been a faddist. Her patterns and designs have always had the basic appeal of superior good taste that women everywhere are quick to recognize. Her ideas are young, fresh, alive and they are firmly grounded upon experience. Anne Orr knows the mechanics of her craft. She is a creative pioneer, who can interpret needlework for the novice as well as for the expert. Although her life and accomplishments paralleled those of other quilt luminaries of the first half of the twentieth century, such as Ruth Finley, Florence Peto, Bertha Stenge, and Marie Webster, no evidence exists that she ever met them. Some of her sophisticated center medallion floral designs appear to have been inspired by Marie Webster's patterns. Anne Orr died unexpectedly on October 29, 1946. The Nashville Banner obituary praised her ability to "capture beauty from everything around her and weave it into the tapestry of her life." Her daughter, Mary Grigsby, kept the Anne Orr Studio open until the mid-1950s, and one granddaughter maintained the Orr pattern copyrights after the business closed. 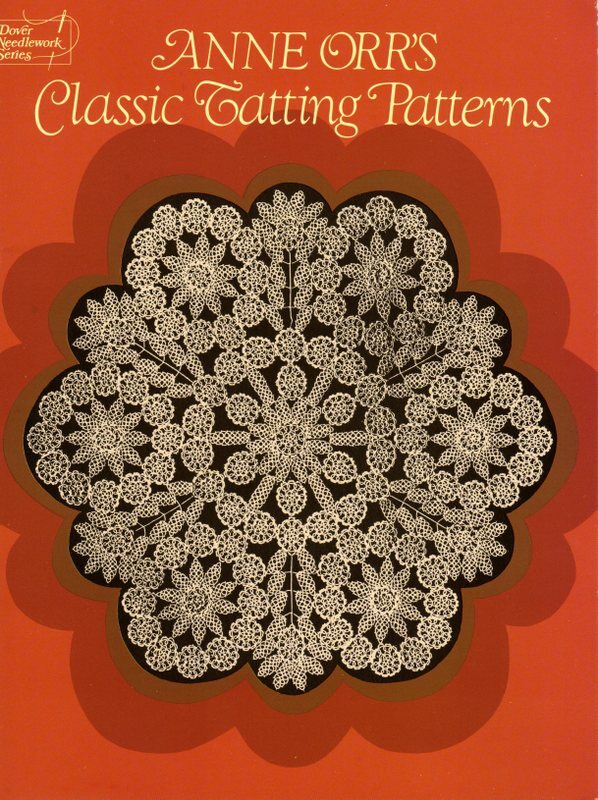 In 1978, Dover Publications, in conjunction with the Center for History of American Needlework, issued Crocheted Designs of Anne Orr, a selection of her needlework patterns from eight instruction books, published from 1916 to 1923. Several others followed, including Quilting with Anne Orr in 1990, with updated instructions. Anne Orr was inducted into The Quilters Hall of Fame in 1980, along with Averil Colby, Florence Peto, Grace Snyder, and Bertha Stenge. Dubois, Jean. Anne Orr Patchwork. Durango, CO: La Plata Press, 1977. Orr, Anne. 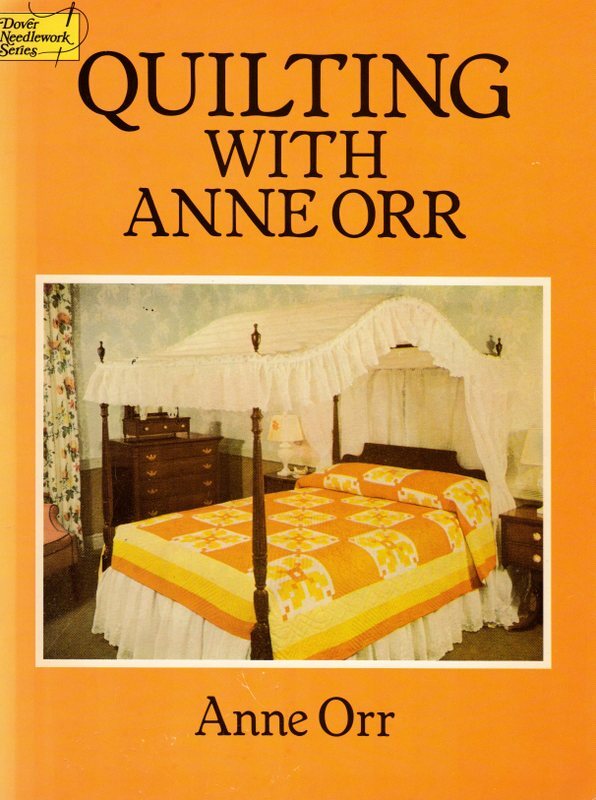 Anne Orr Quilts - Book 50. Nashville, TN: Anne Orr Studios, 1944. ------. Quilting with Anne Orr. Nashville, TN: Anne Orr Studios, 1944. Revised, New York: Dover Publications, 1990. ------. Quilts and Quilting - Set No. 100. Nashville, TN: Anne Orr Studios, 1932. ------. Soft Covers for Hard Times: Quilt-making & the Great Depression. Nashville, TN: Rutledge Hill Press, 1990.